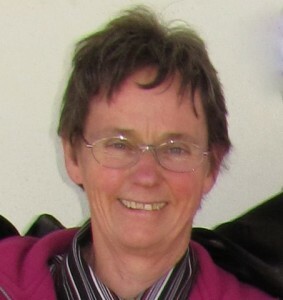 Anne was born and grew up in Auckland, the largest city in New Zealand. Her interest in woolcraft began over forty years ago, when her mother taught her to knit. The first project was an egg cosy (a little jacket that goes over a boiled egg to keep it warm until you are ready to eat it). Within a few years she had worked her way through baby booties and piggy square blankets to jumpers (sweaters). She first tried spinning at high school, and was soon experimenting with spinning novelty yarns. She can still clearly remember sitting on the floor, yarn ends secured by a bed leg, plaiting a slubby white single with two fine black threads. Time consuming, but worth the effort! Fifteen years later, while living in Socorro, New Mexico, she was introduced to weaving and using a spinning wheel. When she returned to New Zealand, she had the chance to learn about farming sheep and goats for fibre. A lucky break with breeding black sheep led to a conscious decision to breed the Fleecewood Leicester (named after Anne’s farm). This sheep produces a naturally coloured fleece, characterised by length, lustre and openness, and is appreciated by spinners wanting a wool with a silky smooth handle. Although developing the farm came first, it wasn’t long before she was spinning, weaving, knitting and felting the wool her sheep produced, as well as selling fleeces. She soon learnt that some customers prefered to purchase prepared wool, so she started washing fleece, and having wool carded for sale. The next adventure was exploring dyeing, including overdyeing naturally coloured fleeces. With every new project came an increased excitement about the creative possibilities. In recent years she has explored new techniques and developed equipment, including the WIZPICK system for coding felting needles (in conjunction with Helen Bishof) and various techniques associated with diagonal weaving. She is qualified to teach at both the adult and a secondary school levels, and now tutors woolcraft learning opportunities in community education settings, as well as Creative Woolcraft Workshops and mentoring at Fleecewood Farm. Anne is passionate about the power of creativity to enhance people’s sense of worth and well being, and continues to use her scientific and teaching background to explore new woolcraft possibilities. Her latest projects include improving this website so she can bring her passion for creativity to a wider audience. She is also aiming to have something new on the website every week or two. For her latest comments, ideas and projects check out the blog. From Anne’s time in the USA, she knows that some woolcraft terms are different in the US compared to those used in New Zealand, and so throughout the website the US term is placed in brackets following the word used in New Zealand. Similarly, units of measurement differ between countries. In New Zealand we use the metric system, but the imperial equivalent is added in brackets. Hopefully, there will be understanding for everyone.